So why not book an Uber to Lewis & Co right now? What’s your excuse? Please note that Lewis & Co will be closed from 30 August through 8 September. 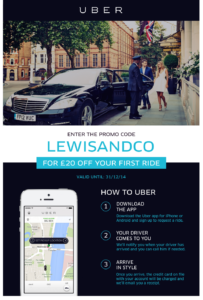 *Both Uber voucher code and Lewis & Co promo discount are valid one time only. Lewis & Co discount is valid anytime in August with Uber receipt.